We work on most kinds of mechanical clocks: mantel, wall, standing (grandfather), anniversary, and antique cuckoo. We work only on mechanical movements; we no longer provide replacements for modern battery movements or plug-in electric movements, nor do we service modern cuckoo clocks, or Korean-made 31-day movements. Among the brands of clocks we repair are: Seth Thomas, Ansonia, Ingraham, Gilbert, New Haven, Kroeber, Jerome, Waterbury, Welch, Terry, Sessions, Enfield, Smiths, Dent, Junghans, Kienzle, Hamburg-American, Urgos, Hermle, Kieninger, Jauch, Howard Miller, Ridgeway, Colonial, Trend, Barwick, Emperor, Gustav Becker, Chelsea, Boston Clock Co., Japy, Mougin and many more. To see some of the more extraordinary clocks we've worked on, visit our Special Clocks page! We no longer offer watch repair or watch battery replacement. Adjust the movement for proper timekeeping (see "A Note About Accuracy" below). Beware of repairmen who take shortcuts with these procedures. See "Service or Disservice?" for more information. For grandfather clocks (and other clocks too large or heavy to move), we come to your house, remove the movement, weights and pendulum, and bring them back to our shop for repairs. When completed, we return and re-install the movement. Beware of repairmen who say they can do a proper job of cleaning and oiling a movement in the home! House calls do incur an additional charge. 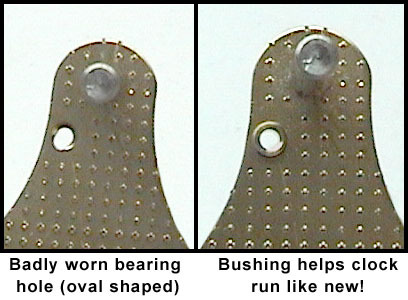 Installing bushings – The holes in which the “pivots” (ends of the gear shafts) spin can become worn. New bushings are installed so that proper gear alignment and reduced operating friction are restored. 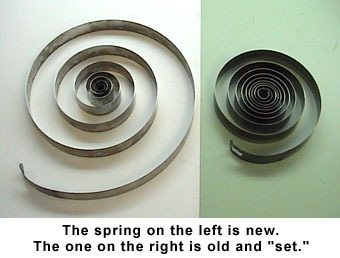 Replacing springs – Mainsprings do not last forever. Even when they haven’t yet snapped, they can become “set,” losing their power to run the clock. Fixing gears – Especially when a spring breaks, it can take gear teeth and other parts with it. 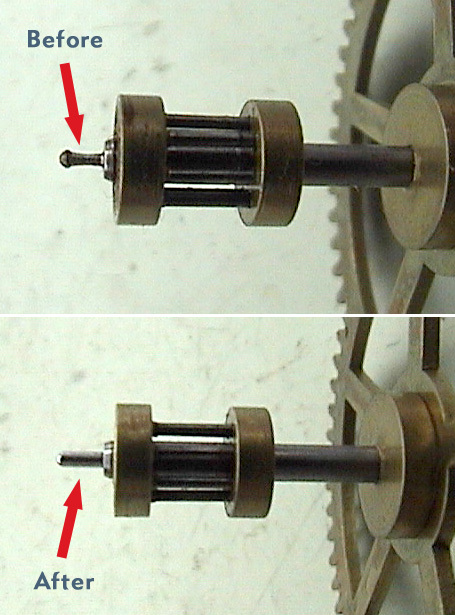 Most gears can be repaired (below), but some may need replacement. Replacing gear pivots – This is what happens when you wait too long to have your clock serviced! The pivots are the small ends of the gear shafts that spin inside the holes on the plates. When abrasive dirt gets into those holes, and the clock is run for years and years without service, the steel of the pivots can, in some cases, be ground down so badly that the only remedy is to replace the pivots. The pivot shown here was 0.031" in diameter. Prestige Clock Repair intalled the replacement to help this old clock run like new. Replacing movements – Clocks with modern, commercially available movements may be easier and less expensive to repair by replacing the entire movement. However, this is almost never an option for an antique, since an improper movement will diminish the value and desirability of an old clock! There are several ways to take care of an antique clock. Repair implies simply fixing what’s wrong without significant intervention. Some collectors like to refurbish a clock, replacing a worn dial with a new one, replating metal pieces, putting new veneer on wooden cases. Restoration implies bringing a clock to as close to its original, but aged, state as possible. This might involve expert repainting of a dial or reverse-glass artwork, or careful treatment of an old, worn finish. Conservancy is maintaining the clock in as close to as-found, original condition, with minimal intervention, consisting typically of conservative maintenance of the finish, and as near to invisible movement repairs as possible. Whatever the needs are for your clock’s maintenance, Prestige Clock Repair will be happy to advise you on the most suitable course of action. In an age of Global Positioning Satellites broadcasting atomically accurate time, the variations in mechanical timekeeping can be surprising. Every effort is made to adjust your clock for its most accurate timekeeping over the course of its winding cycle (for example, daily or weekly). Many things can affect that adjustment once the clock is placed back in your home. The most important of these in a pendulum-regulated clock is leveling. Your clock will be adjusted to run on a level surface. It will be “in beat,” meaning that the “tick” and “tock” will be evenly spaced. If your pendulum clock is not level at home, it will be out of beat and timekeeping will be affected. Temperature can affect timing by lengthening or shortening the pendulum, or affecting the properties of balance springs. In a spring driven clock, it is not uncommon for there to be variations in timekeeping. Over the course of the spring’s unwinding, the amount of power delivered to a movement can vary widely. Nearly every clock has an easy way to adjust its timing. We will go over adjustment with you when the clock is delivered.